In 1837, when Queen Victoria came to the throne, a postal system existed in England but there were already calls for reform. The system at this time required the recipient of the letter to pay the postage. Postal rates were calculated according to the distance travelled and the number of sheets of paper used. Pigot’s Directory of 1839 records that ‘letters from Rochford arrive (by foot post) every morning at 3, and are despatched every afternoon (Sunday excepted) at four, on Sunday they are despatched one hour earlier’. The village postmaster was George Lloyd, who also traded as a grocer and baker in the village. By the time William Appleton had replaced George Lloyd as the village postmaster in the 1840s, a universal penny postage system had been introduced. Introduced in January 1840 ~ the invention of Rowland Hill ~ this system meant letters were charged by weight at a flat rate, regardless of distance, for the cost of a penny by the sender. For the first time the postal service was affordable for all. A method of indicating pre-payment had to be found, and so the world’s first adhesive postage stamp was introduced on 6th May 1840. 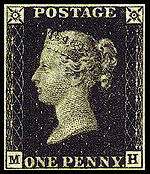 Known as the Penny Black, it was used for letters weighing less than half an ounce. For heavier letters the Twopenny Blue was used. It soon became obvious that black was not a good choice of stamp colour, since any cancellation marks were hard to see. So from 1841 onwards, the Penny Red was introduced. By 1861 Miss Eliza Benton was the village postmistress. The Kelly’s Directory of 1867 recorded that ‘letters from Rochford arrived at 8.30 a.m. in the summer and 9 a.m. in the winter and were despatched at 3 p.m’. Villagers wanting to buy money orders had to travel to Rayleigh. Further improvements in the postal service had been made by this time. With the arrival of the railways and the opportunities for quicker mail delivery that they provided, mail coaches were now used much less. The availability of stamps meant it was no longer necessary to go to a Post Office to send a letter, as stamps could be purchased and used when they were needed. This led to the invention of the pillar box in the Channel Islands by the novelist Anthony Trollope. By the 1850s his pillar box scheme was introduced in England. Eliza Benton, born at Thundersley in about 1812, was the daughter of Mary Benton, a farmer’s widow. Prior to becoming the village postmistress, Eliza worked as a dressmaker. She died at Hadleigh in 1890, aged about 78 years, and served as the village postmistress for about thirty years. Eliza Benton would have seen other improvements in the postal service during her time as the village postmistress. In 1870 the Post Office issued postcards, which could be sent for ½d. The postage rate was imprinted on the cards. Payment in advance meant that, as the letter carrier ~ or postman ~ no longer had to collect payment from each recipient, letter boxes could be fitted to front doors. In 1870 the control of the Telegraph Service was given to the Post Office. Customers could now go to a Post Office to send telegrams. However, villagers in Hadleigh had to travel over two miles to either Leigh or Rayleigh to buy money orders or send telegrams. From about 1890 the village post office was run by the Potter family. James Swain Potter moved his grocery and drapery business to the other end of the High Street, to the building which is now the Conservative Club. As well as postmaster, grocer and draper, the prosperous Mr. Potter had taken on the tenancy of Hall Farm, situated on the corner of Castle Lane and the High Street. With the post office now sited in larger premises, money orders and telegrams could now be sent from Hadleigh. Letters arrived at the post office from the Rayleigh sorting office at 8 a.m. and 10.45 a.m. and were despatched at 12 noon and 5 p.m.
James Swain Potter died in 1891, aged 66. Kelly’s Directory of 1895 lists his wife Caroline as the sub-postmistress. By 1899 the post office was being run by Miss Emma Potter. Born at Hadleigh in 1858, she was the daughter of James Swain Potter and his wife Caroline. Miss Potter served as the village postmistress for over thirty years and died in 1939, aged 80 years. At the time of Queen Victoria’s death in 1901, Miss Potter was offering additional services such as a Savings Bank, insurance, payment of annuities, express delivery and a parcel office. The post office was open seven days a week, as on Sundays it was open from 8 a.m. to 9 a.m. for the sale of stamps and from 8 a.m. to 10 a.m. for telegrams. My late Mother worked as a counter clerk in Belshams Post Office in the 1930s and met my Father who was a Sergeant in Hadleigh Special Constabulary. They married in 1936 and went to live in a house opposite Thundersley Post Office where my Mother subsequently worked. The Belshams were family friends and I recall visiting the back of the shop as a small child and being fascinated by the large open trap door leading to the cellar store-room. I also franked by lead hand-stamp all the mail collected from area post boxes and bundled letters into sacks in the small Sorting Office behind Thundersley Post Office for collection by the Southend mail van. On one occasion our family were locked in the back of the van with the mail bags to travel to Southend to see the lights. As the area developed The Sorting Office was moved to a Portacabin in front of the Post Office while the new Regional Sorting Office was built on land behind Thundersley Post Office. I remember when the Post Office was opposite the The Castle Pub and was known as Belshams? One side was a grocers, the other side the Post Office with separate entrances but the staff could get from one to another without the need to leave either shop. I still have a £1 premium bond bought from there around 1969. My dad worked as a postman at the Hadleigh sorting office. The building still stands opposite The Castle pub in the High Street and is a restaurant. I believe there was a front counter there too. 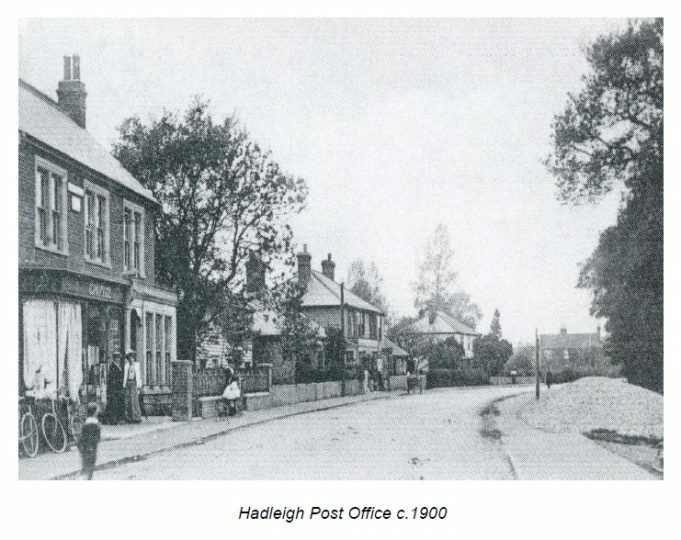 The Hadleigh sorting office was then moved to Church Road Thundersley and amalgamation with the small sorting office at the junction of Kenneth Road, Hart Road and Church Road, (a garage behind the shop) which is now known as Benfleet postmans delivery office and covers Hadleigh, Thundersley and Benfleet. An excellent piece of research. Thanks, Chris. Looking forward to many more like this. Any more pictures of the Post Office, anyone?